For the past 40 years, Fitzgerald Moving & Storage has been the premier choice for all of your commercial, office and specialty moving projects. We have built many long-term, repeat customers since first opening our doors back in 1978. If your business plans call for a move to Silver Spring or anywhere else in the region, let us show you why we are the top commercial/office moving company in the area. Over our many years in the industry, we have handled every kind of commercial/office move. Every customer has their own specific requirements and we work every day to make sure we are meeting those needs. Once you hire us for your commercial/office move, we will get to work right away on planning all the details of the moving project. We will start with a pre move plan and work through the logistics for both the move itself and the arrival at the new location. Even before you move, if you need help getting packed up, we can take care of that too. If your plans call for the use of professional storage space, no problem. Fitzgerald Moving & Storage has plenty of secure and clean storage for both long and short term use. Silver Spring is a well-known, unincorporated community that is located in Montgomery County, MD. The population of the area is just over 76,000 citizens. The city gets its name from a mica laden spring that was discovered in the area in the 1840’s. An easy commute, Silver Spring is only 8 miles north of Washington, D.C. and many people commute back and forth every day. 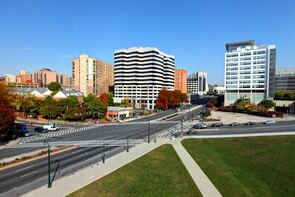 Silver Spring has many restaurants, theaters and other attractions for citizens and visitors alike to enjoy. You can count on our professional, dedicated crew to make sure that all details of your office move are well planned and carried out to your satisfaction. As business people ourselves, we know how critical it is to get your operations back up and running as quickly as possible. We believe that our success as a business over the past 40 years has a lot to do with our dedication to customer service. With this in mind, we assign a dedicated service person to each and every customer. This individual will be your go to source for all your needs during the moving process. This very successful approach will ensure that your experience with us is smooth and stress free. If you are planning a move to the Silver Spring area or anywhere else in Maryland, Virginia or Washington, D.C., please call us today to learn more about how we are the right choice for your moving needs. You can also fill out a brief, online form to receive a no obligation quote!